Sacrificing comfort for beauty is often what gets us interested in finding solutions for sore feet. Minimizing the pain and hanging on to our favorite heels may not be impossible, though. 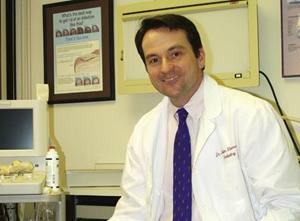 We spoke with Dr. John Viscovich, a podiatrist based in New York, to learn more. LoveToKnow: Thanks so much for taking some time to speak with us, Dr. Viscovich! Please tell us a bit about your professional background. John Viscovich: I have been a podiatrist for the last eight years. I graduated from the New York College of Podiatric Medicine and completed a three-year residency in total foot reconstruction and diabetic limb salvage at Wyckoff Heights Medical Center. I have written and lectured on foot care extensively over the past two years. My practice is centered on sports medicine which really encompasses everyday life. I currently practice in Mount Kisco, NY. I do not just like what I do - I love it. I have a background in the hospitality industry with my family and there is nothing I would rather be doing professionally. I get such a rush out of helping people walk and function more comfortably. LTK: And that's something our readers will be very grateful for! One thing many of our readers have in common is a love of high heels. Yet we hear so much about the downside of wearing these shoes. What common problems exist beyond the everyday aches and pains that accompany walking around in our favorite heels? JV: I have written an article on some of the pitfalls of high heels. As a professional, I cannot endorse them, but I am realistic about fashion and try to minimize these pitfalls. Heels and ill-fitting footwear can cause many deformities for the feet: bunions, corns, calluses, hammertoes, neuromas and even knee and back pain. There are several products out there that help minimize the affects of high heels. Foot Petals has a whole catalog of products that really minimize trauma and protect the feet in high heels. SOFFT, Inc. has a wonderful selection of shoes that are fashionable and somewhat better for the feet, including heels. LTK: Do the feet suffer more during the winter? How much of an impact does the weather have on the condition of the skin on the feet? JV: Not necessarily, but it really depends upon the person. In the winter, I would say the majority of problems are related to dry skin. This leads to cracking, fissuring and even infections. The dry skin is related to the dry heat that is in most of our houses today. One gets dry, cracking and itchy skin leading to eczema and dermatitis. This can become chronic. Heel fissuring can be so painful that you may actually bleed and be unable to walk. The winter also causes a lot of trauma that would be the second most prevalent thing in the winter. Ice, snow, rain and cold lead to lots of falls and sprains. Proper shoe gear can prevent a lot of this. Summer presents the challenges of athlete's foot and fungal nails - not so much suffering, but a lot of aesthetic things. Are gorgeous shoes like these good for our feet? LTK: A big trend right now is high-heel ankle boots. For women who love them, what are some solutions to make those sore feet a little easier to tolerate? JV: Again, I defer to my friends at Foot Petals - wonderful products. But in all honesty I have not seen that many different problems with these as with high heels. One thing that one person asked me about was chafing on the side of the foot. A simple remedy was the use of moleskin on the inside of the shoe. LTK: What is one of the biggest discomforts associated with high heels? JV: A lot of women develop tightness in their Achilles by wearing high heels. Think about it: the front of the foot is pointing down while the back of the heel is pointing up. The Achilles adapts and tightens. You can develop forefoot pain, Achilles tendonitis and a whole list of maladies from a tight Achilles. I treat a lot of this. The majority of this is treated with inserts, heels lifts, and stretching. I use adjunctive therapies, such as anti-inflammatories, injections and sometimes shockwave. Rarely does this have to be treated surgically. LTK: What are your tips for maintaining optimal foot health year-round? Is there a regimen you recommend? JV: For women, I stress be smart with the heels. Do not walk miles in them! Bring a pair of walking shoes with you if possible. Also, in heels, use different padding that can minimize the trauma that your foot feels in this unnatural position. Wear weather-appropriate shoes, including boots with rubber soles in the winter to prevent slipping and sneakers that breathe in the summer to prevent fungal infections. Don't forget cotton socks in the winter to absorb moisture. Finally, do not let the feet get overly dry - moisturize! There are great OTC meds such as Amlactan that work great.